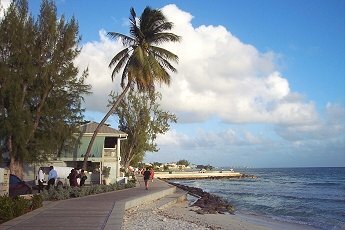 The Barbados Boardwalk on the south coast of the island was created admid some debate. 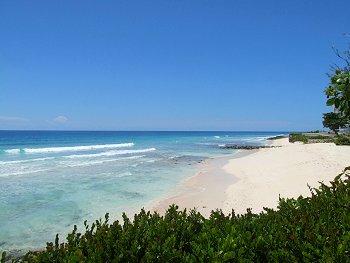 There were some concerns about the environmental impact on habitat, reefs and beaches, as well as the affect on homeowners along the proposed site. Several changes were made including making the boardwalk a few hundred yards shorter than planned. 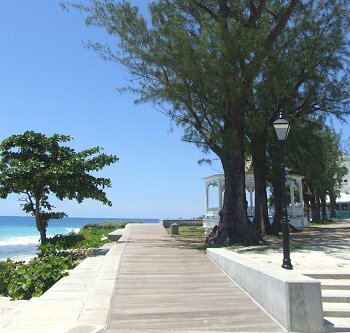 The end result is admired by Bajans and visitors who enjoy the new walk by the ocean. It is the first Barbados Boardwalk by the sea, complete with panoramas, seats and retreats. All ages and abilities use it. There are joggers, fast walkers, strollers, talkers and quiet people, wheelchairs, blind people, seniors, teenagers and babies in prams. The ambiance is friendly and respectful. 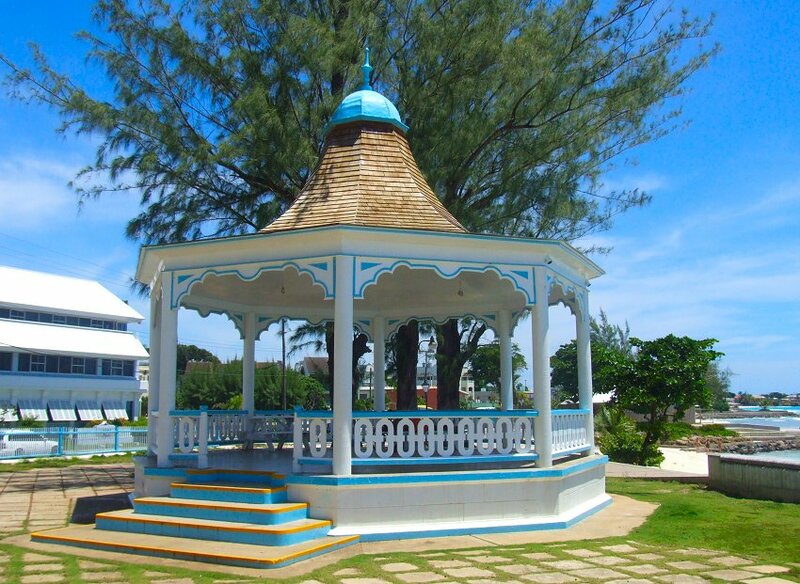 Blending with the natural beauty, it is a solid structure set deep into the sand and bolstered with granite rocks. It looks like it is here to stay! 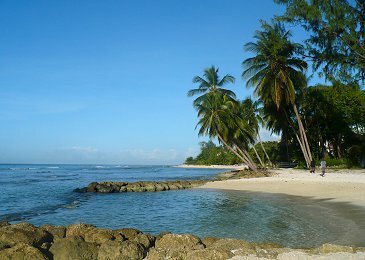 At the western entrance the coconut-lined shores turn to soft white sand leading to lovely shallow pools, popular with families as both the old and young can splash in the calm waters. Benches overlooking these pools invite you to relax and watch the sun set. Here you'll also find Camelot an original home much refurbished by a leading architect, in his unique design with finishes inspired by the Barbados Chattel House. 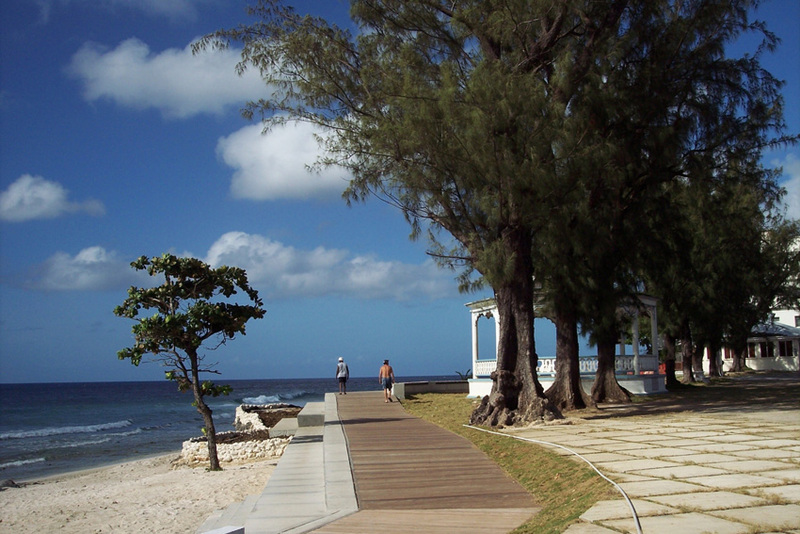 Much of the boardwalk is lined with tropical plants and shrubs. 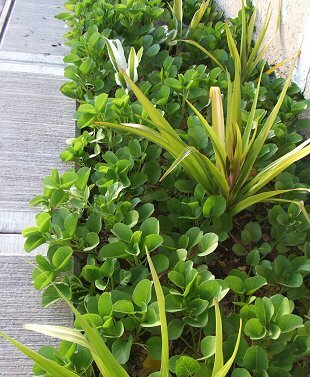 Hardy shrubs are intermingled with flowering plants, adding to the overall beauty. Past South Ocean are a couple of private homes. Most are owner occupied and they too had misgivings and some still worry about the crowds. Few can fault the work and the construction. 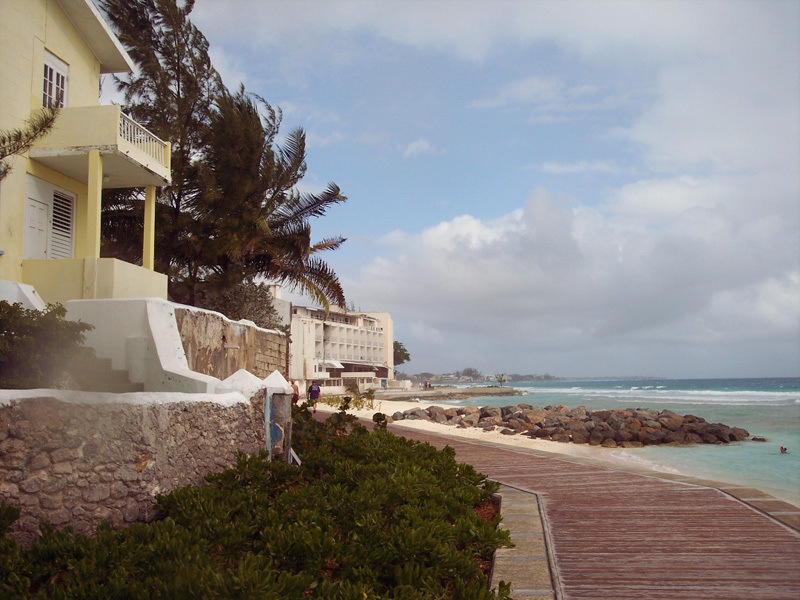 The boardwalk has enhanced many a property with more beaches and greater water access. 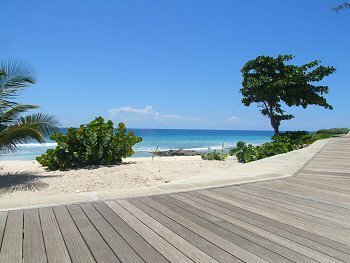 Stay in a vacation condo at South Ocean Villas to enjoy stunning ocean views and direct access to the boardwalk. 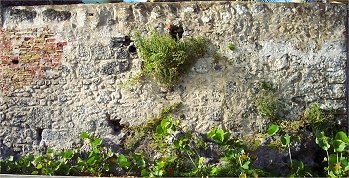 A heritage house sits behind this wall. 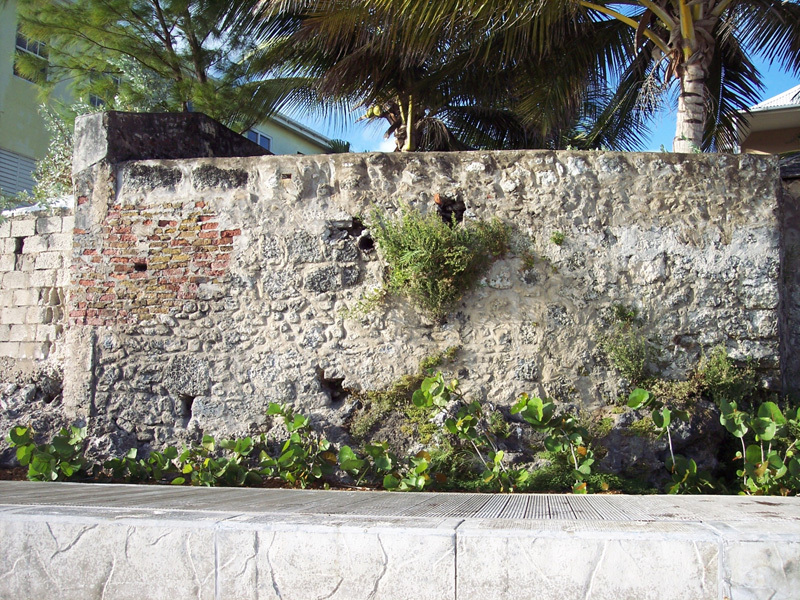 The old wall still stands protecting the heritage home: a sculpture in coral stone, brick, concrete and mortar, aged by nature, and growing things. It is a fresco of subtle creams and grays, textured and patched with pink and green. Many hands have made this piece of art. It cannot be replaced with a more modern structure. It is protected by the Barbados National Trust and must be repaired in keeping with its look and heritage: a mixed bag of brick, coral stone, granite, motor and cement. 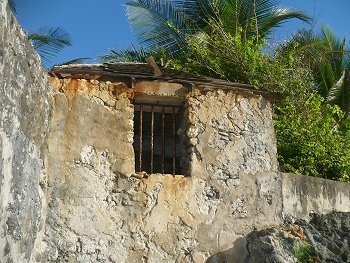 Painted and bare, eroded and rustic - an original! perhaps a pantry? - Not so. 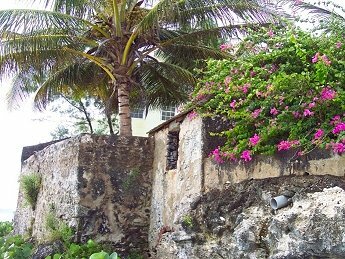 For an infamous time in its varied history, this was a slave holding area. 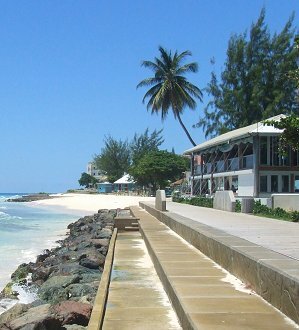 The boardwalk stretches 1.6 km between Camelot and the famous Barbados Accra beach. It takes you past history - wind, sand, sea and salt. Past restaurants, hotels, beach bars and places to sit and stare. Waves, wind and chatter, humming as you go. Past jetties build into the sea, cool and invigorating in a strong wind. Past new sandy beaches leading to the old police band stand at the Hastings Rocks. 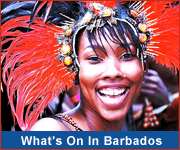 The Barbados police band, which has published several excellent CDs, still plays music here on occasions. Hastings Rocks is also a favourite venue for fairs and get togethers. 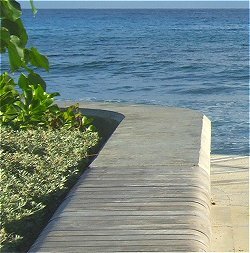 Massive concrete blocks hold the hard wood walkway. Below them and under the sand granite boulders from Canada secure the footing. 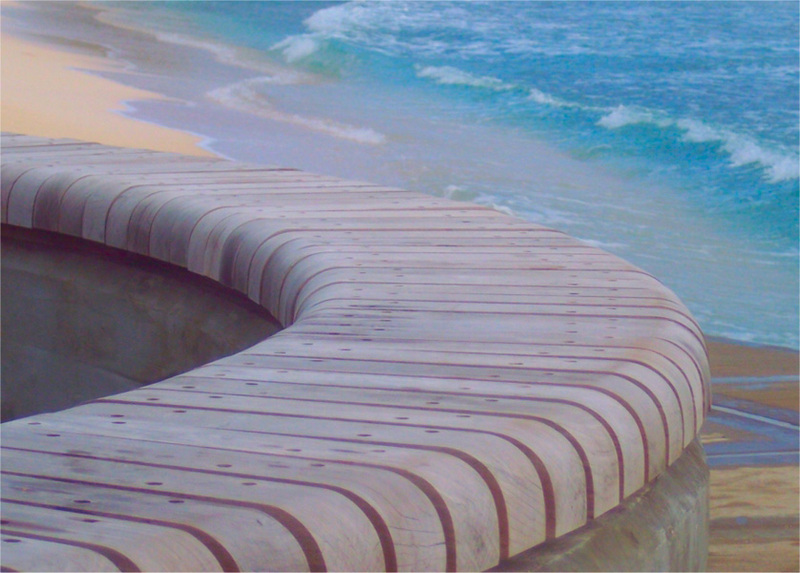 Built to withstand a hurricane, this walkway is meant to last. Past trees preserved and some added, planters made with coral stone and filled with earth, edging sand. 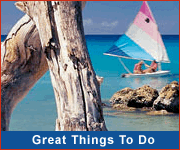 Past beaches, sea and inshore reefs. Past tidal pools in the low tide. like a tonic on your face. 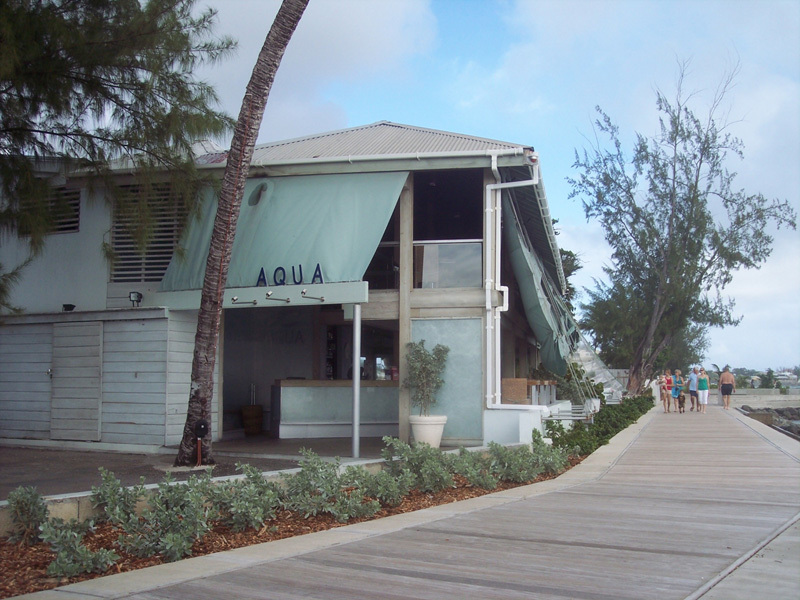 Tapas Restaurant faces directly onto a boardwalk with tables set permanently on the patio; the European style of pavement dining. Still got some energy left? Good because there's lots more to see! 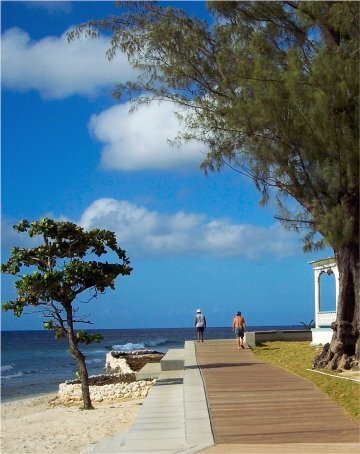 - with a fisherman and his dog, inshore pools and reefs and the main Boardwalk Promenade! Let's go! 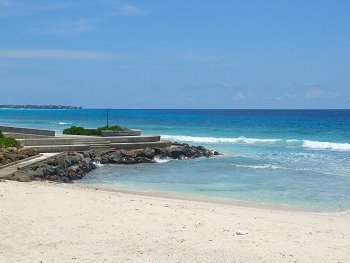 Then we'll hit the skip ahead to Accra Beach and, with the sun at our backs, make our way back to KFC! Jump ahead!